(March 2019) The translation project of the Carolinian New Testament seemed to have stalled in recent years, even though all the books had been checked by a translation consultant, and the various computer checks on quality and consistence had been completed. The translation team felt that more input was needed before publishing the translation. When one approach to collect this feedback fell through, they decided to print a small run of the New Testament so that more people could be involved in a final read-through. In order to kick-start this process, Nico Daams took the printed copies to Saipan, and a small steering group of four met on the first day he arrived. 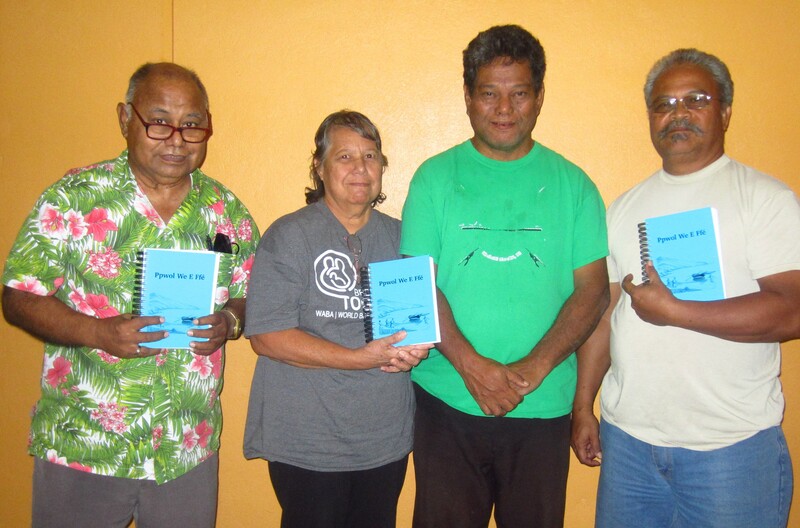 This group accepted the challenge to read through the entire New Testament in three months. In order to make that possible, they selected ten Carolinians who will read through specific sections of the N.T. They will come together once a month to bring their comments to the group for final decisions. If the group is divided in their opinion, then Father Sid, who is a Carolinian priest, will cast the deciding vote, and they have committed themselves to accepting that decision. The focus will be on naturalness and to see if there are any glaring errors. More meetings with the various stakeholders confirmed these decisions, and Nico and the team have a new confidence that this will soon bring the Carolinian N.T. to the point where it can be printed and the people can start using it in their church services and in their private readings. Carolinian translators holding the trial edition of the New Testament. From left to right: Jess, Ignacia, Father Sid, Manny.